Whether it’s the Toyota Vitz Cup in Japan, the Volkswagen Sirocco-R Cup in Germany, or similar racing series around the world, one-make races feature one make/model, the same engine and performance parts, and a bunch of drivers all aiming to cross the finish line first. 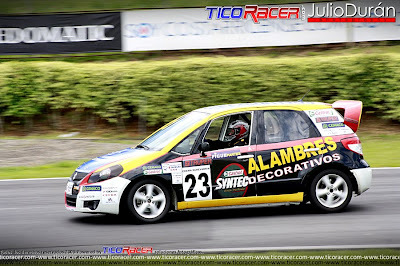 One of the more interesting one-make races I recently heard about is the Copa Suzuki SX4 (Suzuki SX4 Cup) in Guatemala. I’d seen a few photos and videos before, but didn’t know much about the series. While talking with the owner of Road Race Motorsports, Rob Tallini, I discovered his company was involved with the series. Being a rabid Suzuki fan, I wanted to know all about it. It all started when Suzuki of Guatemala approached Road Race Motorsports (RRM)—one of the foremost Suzuki tuners in the world—looking for assistance in tuning and setting up the race cars for the series. Problem was, however, in Guatemala, the Suzuki SX4 is sold with a 1.6-liter engine, not the J20, 2.0-liter engine RRM is used to tuning. To remedy this, Tallini suggested using the 2.0-liter SX4 sold in North America instead of the Guatemalan 1.6-liter variants. This would allow RRM to apply its wealth of J20 engine tuning experience and use its existing lineup of J20 parts instead of having to develop new items for the 1.6-liter. 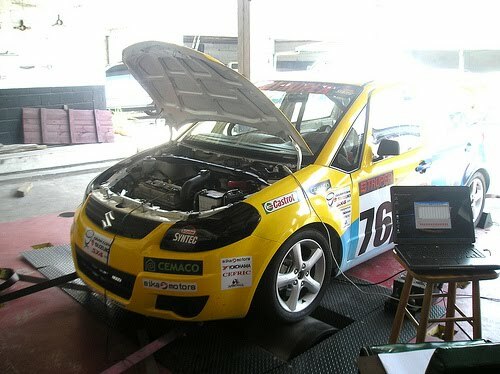 So, in 2009 (at the height of the Swine Flu pandemic), Rob traveled to Guatemala to assist tuning/setting up the SX4 Cup cars. So what makes up a Copa Suzuki SX4 car? To start, the series uses front-wheel drive, manual-transmission-equipped SX4s sent to Guatemala from Japan. Next, the cars are equipped with a host of go-fast parts from RRM including the company’s pulleys, piggyback ECUs, intakes, headers, brakes, and suspension components. The stock 16” alloy wheels are shod with racing tires, roll cages are installed, weight reductions are performed, and exhaust systems are made. 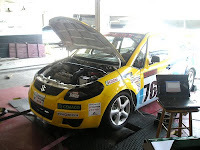 When Tallini was in Guatemala, he and his crew took two prepped sample cars to a dyno in Guatemala City for tuning. When a suitable fuel map was determined, all of the cars were loaded with identical maps. In an attempt to keep people from doing additional work on the cars, the vehicles are impounded before and after races. When completely finished, the prepped cars are sold to racers who add custom paintjobs, graphics, and sponsor decals to the exterior. Most of the FIA-sanctioned races are held at the Autódromo Pedro Cofiño in Guatemala (other races are held in El Salvador and Costa Rica). The Autódromo Pedro Cofiño is a small, tight, Euro-centric track that lends itself to lots of great racing. There are 7–8 races a year. “The SX4 Cup is a crowd favorite,” said Tallini, “There’s an element of ‘go-kartness’ because of the tight course.” Add to this the area’s inherent beauty and amazing geography, and you’ve got an intense racing locale. “The area is surrounded by smoking volcanoes. It’s an amazing setting; a surreal, psychedelic place,” said Tallini. Tallini said competitors in the Copa Suzuki SX4 are very serious about the racing, have lots of support, and are of an elite caliber. Many racers even arrive at the racetrack’s helipad for the event. Tallini said, “In Guatemala, there’s soccer and there’s racing. Nothing else matters.” Luckily for Central American race fans, the Copa Suzuki SX4 is televised. For those of us outside of Central America, some of the Copa Suzuki SX4 races can be found on YouTube and other various sites.